Tapestry differs from cloth weaving in two important ways:- firstly the warp (the vertical thread) is completely covered by the weft (the horizontal thread), and secondly the weft thread does not travel all the way across the weaving from edge to edge but works in areas which are dictated by colour and design. In the past, materials used for making tapestry depended largely on what was produced in the area. In Europe wool was the most commonly used material whilst in Egypt cotton and linen were also used. 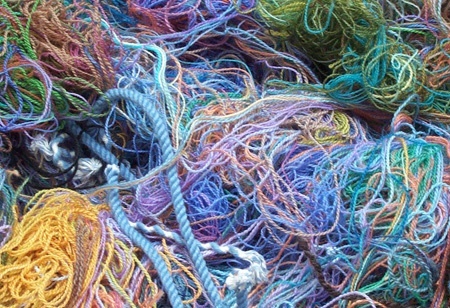 Since the 19th century better trade links and new fibre technologies have meant that tapestry weavers now have access to a wide range of materials both natural and synthetic. Despite this wool is still the most common material, used for its beauty, durability, handle and ability to take dyes successfully, as well as its sustainability and relatively benign preparation processes. Tapestry makes a firm and solid fabric which does not usually drape enough to be used for clothing or other domestic purposes. It is also an extremely durable and robust fabric, capable of lasting almost indefinitely if protected from strong sunlight and moth. Its prime function has always been decorative. In the days of stone walled castles, tapestries would perform as decoration, soundproofing and insulation. They were portable and could easily be taken down, rolled up and transported when wealthy or royal households moved between their estates at different times of year. They were also sometimes paraded round the streets in procession on holy days. The slow making process of tapestries, maybe a half to three quarters of a square metre per weaver per month, means that they have always been an expensive and prestigious luxury item, highly prized as status symbols by the elite.